This kit produces colorful results in just fifteen minutes. The procedure in this activity quickly yields large amounts of plant pigments, making it easier to complete than traditional solvent extractions. Students learn the basics of paper chromatography, including the use of petroleum ether or acetone solvent, and calculate the rate of flow (Rƒ) for each pigment. Once students complete the experiment, they are rewarded with a vivid chromatogram that displays chlorophyll A and B, xanthophyll, and carotene pigments. They also gain an understanding of the different affinities for mobile and stationary phases. The kit includes a teacher’s guide, a student copymaster, and enough material for 15 setups. It is recommended that this procedure be performed under a fume hood. Ordering information: This kit includes chromatography vials with caps, chromatography strips, disposable pipets, metric rulers, and chromatography solvent. 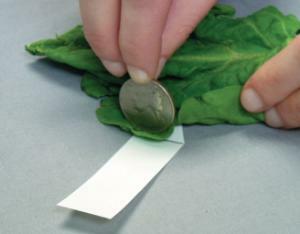 Fresh spinach leaves, coins, pencils, scissor, forceps, and a chemical fume hood are required but not included.